Of course now that I have way too many chicks, two of my hens go broody at the same time. And the black one sitting, bereft and belligerent, in another nest box on three brand-new eggs. Oh cool move, goldie. Just come in at the last minute and take all the credit. Because a couple nights later I opened the nest box to check on them and … surprise! Guess it’s too late to switch them. Oops. No idea how many chicks there are yet – I know she was sitting on like 9 eggs, but they were all laid at different times. The little ones that I can see are all different colored – I love barnyard mutts! I can’t wait to see what they look like! In the mean time, the black hen refuses to abandon her post. 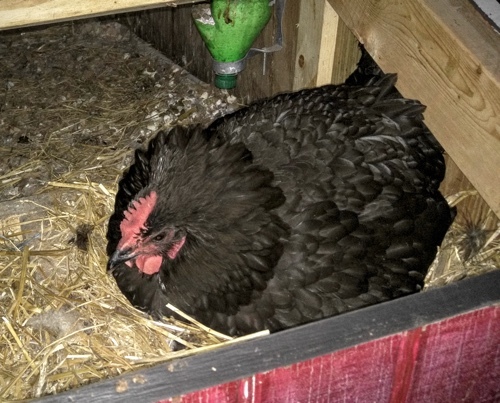 Since I really, really, REALLY don’t need any more chickens, I slipped 6-7 duck eggs under her. I can always use more duckies. And if a mama hen can raise them instead of me? Score. No changing poopy water three times a day for me. Chickens raising ducks are supposed to be a match made in heaven: mama hens are constantly anxious because their little chicks run and scatter all over the place. Mama hens work themselves to the bone just trying to keep their dumb chicks from killing themselves. Meanwhile, duck mamas are notoriously negligent. They’ll just take off and abandon their ducklings, so ducklings are born with an innate instinct to stick as close to mama as possible at all times. 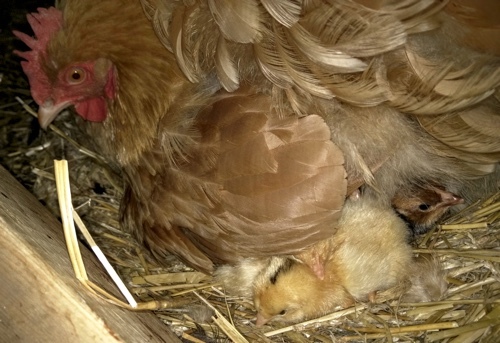 So a nervous mama hen blessed with tiny fuzzies who always stay right next to her = happy mamas. Unfortunately, ducklings take 28 days to hatch instead of 21. 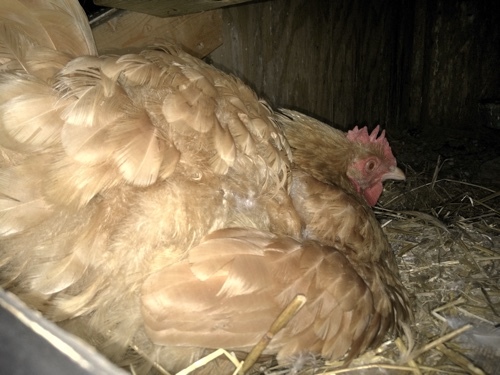 So this determined little hen will be sitting for 6 weeks before she’s rewarded for her efforts, poor thing. I wish I’d managed to switch them in time. This entry was posted on Sunday, May 22nd, 2016 at 12:58 pm	and is filed under homesteading, animals, sustainability. You can follow any responses to this entry through the RSS 2.0 feed. You can leave a response, or trackback from your own site. Atom, Entries (RSS .92), (RSS 2.0) and Comments (RSS 2.0). 26 queries. 0.265 seconds. Top.